Do I see it correctly that you end up with same target for next time as the first was slower? Tako wrote: Do I see it correctly that you end up with same target for next time as the first was slower? I massive 2 tenths under target. That's going to hurt. Having HD'd the last 2 times I tried the 4 x1k my aim was just to complete it at 1s pace slower than last time. Managed 1:43.5 pace which was 1.1s slower and in a very non PP way. Leg wobbly hard given the heat and humidity and I am paying the price for starting the plan too quickly. Today I tried the 30min as hard distance for my first week with the PP. Tako, nice 1.5's shame about the 30 min, but it is hot and a great warm up! Ian, well done to get faster (or indeed complete the set) after a slower first. Max, Pete suggested backing off 1S/500m periodically on each workout when you get to a point that you cannot go faster, that way you get a few more cycles and break through in a month or 2. Also he suggested backing off 1S/500M per week without training. 2:11.8R20, 2:11.6R21, 2:10.9R22 & 2:07.8R24. Really struggling to get rating up, but much higher work per stroke so happy. Actually averaged 2:10.5 the same as my fastest in first attempt and the final was the fastest 2k so far since restarting so added provisionally to Nonathlon. Must manage a quicker rating next time or this will be a car crash! Not sure why, but struggled to up breathing to 2 breaths per stroke, found pace dropped at the same rating when I tried. Far too much at low rating! Any ideas? Given it was substantially cooler than of late, I was hopeful for a decent time. As this is turned out, I beat my pace boat but fell well short of my pb. On the vaguely positive side, my heart rate trace rarely slipped out if heavy CV territory. Iain, Pity it's only 1s/500! Will see how I get on over the next few weeks. Ian, Nice steady state today and you inspired me to go for 10k rather than my usual 8k. Nice 10km Max - it's a long term objective to reduce the s/m on these pieces, so 23 is inspiring. 6x1km,1r today. 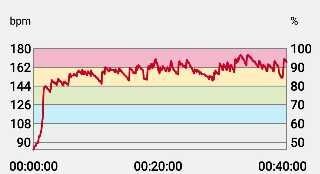 The heat seemed a bit worse today than of late, so I feared a tough session. Reps 1-4 were quite steady and ahead of pace, but I lost rhythm by rep 5 and 6 was damage limitation. 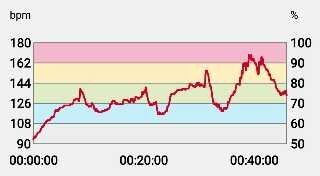 My heart rate trace mirrors this pretty well. In that context, trimming 3s off my overall time isn't bad. I'm still relatively early in this session, so it's fairly low key (for the most part!). I aimed to knock 1s in pace per split, and that worked until the final rep.
... and that worked until the final rep. Yes, but the last rep was faster! Which is not something I can currently claim . 10x1m @ 1:37.1 which is 0.6 slower than last time. Horrible idea that - 10x1min, and respect is due for keeping that pace. Good practice for the current CTC. I've returned to my second stage (highly aspirational) pincer movement between alternating 30 minute Vs 8km steady state rows. Today was a bit rough for no good reason I could fathom, and 8km seemed incredibly long.... Finished with 32:50, and a tantalising target for next time. ...and a tantalising target for next time. I know you are trying to increase your 30mins distance but do you try and better every steady / hard session you do? Yesterday was 8k @ 1:56.9 and today was the 250m pyramid. Pleased to say it was 0.3s pace faster than last time @ 1:41.7 . The last 250m interval was 1:34.0. Not every time, depends how I feel and what I've done the previous day. Not a desperately logical system. End of cycle 3 today! 3.5k/2.5k/2k @ 1.47.8 which is the same as last time. I'm going to try the interactive plan for a few weeks and compare/contrast apparent fitness and progress. I'll look forward to reading progress here though! Whilst I will miss your inspiration and support on the PP I'll be interested to hear how you get on. 12x250m @1:35.0 which is 0.1 pace faster than last time. Four days into the first easy week, it's a lesson in holding (for me) very low s/m. Not wheezy tiring like some of the pp sessions, but a good CV workout. I'll pop the traditional tables and graphs over there for interests sake. Ian, I wish you luck with the IP, I found that the pace targets did not give the requested HRs, while my HR drift made longer rows require slowing even when started at very easy pace and I found it very unsatisfactory finishing at an ever decreasing pace. Max, nice pyramid. Well done to finish the minutes, a horrible session to maintain when it starts to go wrong due to the incomplete rests. 500's for me. 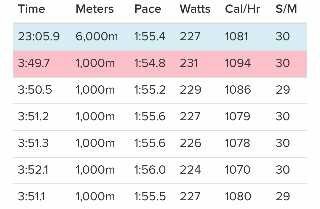 Hadn't done this for 4 years, but had 2 failures at 6x500r1' as prep for the last CTC, also have had a week off with only a couple of LSDs back, so cautiously started with a 2:01 intended target. Felt relatively easy so neg split the faster first interval. Last not as easy as it seems, didn't pull a stroke below 1:52 despite trying, barely maintained pace at increasing rating as interval proceeded. 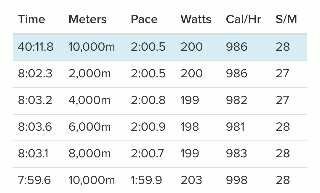 Compares well with last short interval some time ago, 4x1k at 2:03.9 average. Still slow, but improving. Aborted my planned 5x1.5k today in 4th interval. Last time averaged 2:12, stayed at R23 but pace was too quick. I am struggling with my breathing rhythm. 1 breath per stroke and I cannot maintain any distance, 2 and I slow down for the same rating. 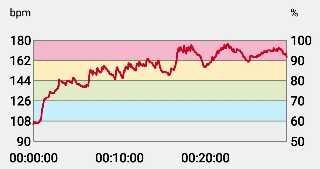 Need to establish a 2 breath rhythm for long intervals. Did a recovery row and then started a positively split 500r0' to see if I could improve my 1k or 2k SBs both from interval sessions. Managed a 2k SB. Iain, well done on your 2k SB. 8x500 today. Missed a start so had the benefit of a slightly longer rest period as I re-set the monitor. Average pace over the 8 was the same as last time at 1.39.0. 5x1500m today. Average pace 1:46.5 which is 0.3 quicker than last time. Yesterday, for some very stange reason I decided the steady state / recovery row would be a 30r20! Some good sessions there Max. Tired after my SS hour missed SB by 40M! gave up on the csheduled 5 x 750 and did 10 x 1'r1' instead. First 9 felt harder than they should have, but each neg split by 1M, 1:55.8 R31.3 avg, Butmanaged 1:50.2R38 for last, so could have gone faster.